A robust police response has been urged to deal with anti-social behaviour at Larne Town Park following further vandalism. Damage costing £200 was caused to trees and glass bottles were smashed following a weekend drinking spree. DUP MLA Gordon Lyons stated: “This is the second year in a row in which concerned local residents have contacted me about vandalism and anti-social behaviour in the Town Park area. 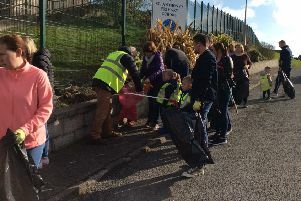 Marty McKay, event director, Larne Junior Parkrun, says that on Sunday mornings, two or three volunteers regularly clear the route of broken glass, bloody tissues and occasionally slates, condoms and fireworks with brushes and shovels, before the event, which is attended by between 40 to 50 children, aged from four to 14 years, can go ahead. “The dog fouling is horrendous,” he added.